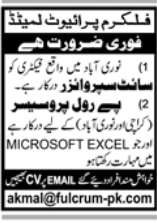 Site Supervisor Job is available with Fulcrum Private Limmited in Pakistan, Karachi. It is a Senior Level level role. This applicant should be Bachelor’s Degree in Engineering qualified for this position. This job will expire on 15 May 2019. This job involves skills like Commercial awareness. Team working and communication. Technical skills,	Management skills,	Problem solving, Experience required is 3 Years.